The question we get asked the most at our info nights! For artists we want to see 3d competency, or exceptional 2d work with small amounts of 3d. For coders we want to see code examples, links to work on github are great for this. 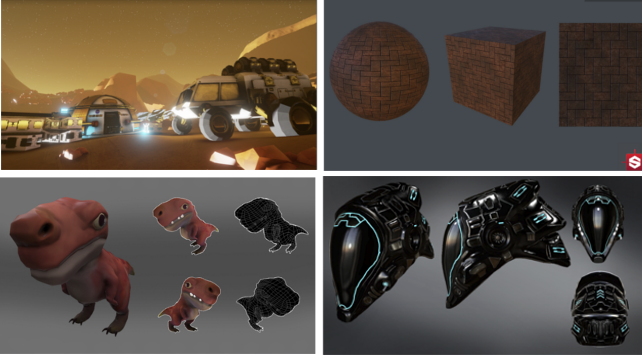 Applications that show moderate skills across several fields (for example 2d illustration and 3d modelling and rigging and game development and video editing) are highly regarded. Re files themselves, pdf, jpg for stills are great, try and keep them under 100mb. For video, mp4 is fine, links to showreels on vimeo/youtube/google drive/dropbox etc are better. Don’t send us Maya .ma/.mb files, Unreal .uproj files , Photoshop psd’s, any source files from DCC apps, we don’t have time to open them. 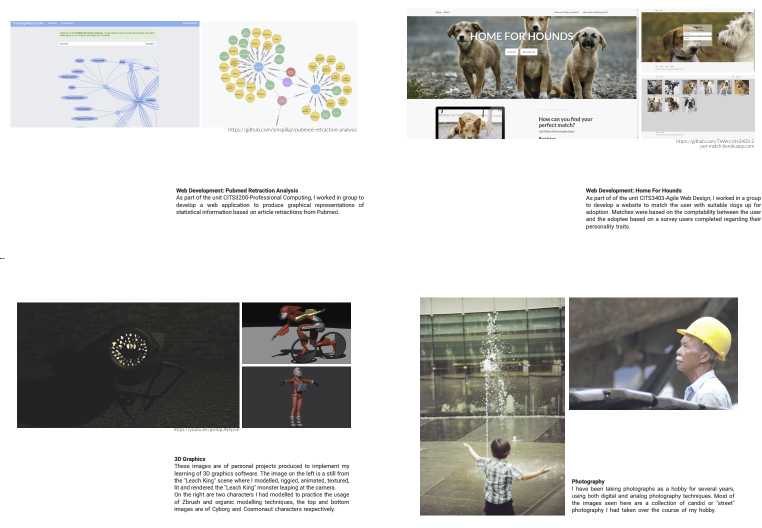 Some brave students from our 2018 cohort agreed to let us share their application portfolios. Below we explain what we saw, why we agreed to interview, and their skillset by the end of the masters degree. Many thinks to Terry, Wen, Alexis, Samantha, Jemima, Calum, Jorge and Ailisha for sharing! 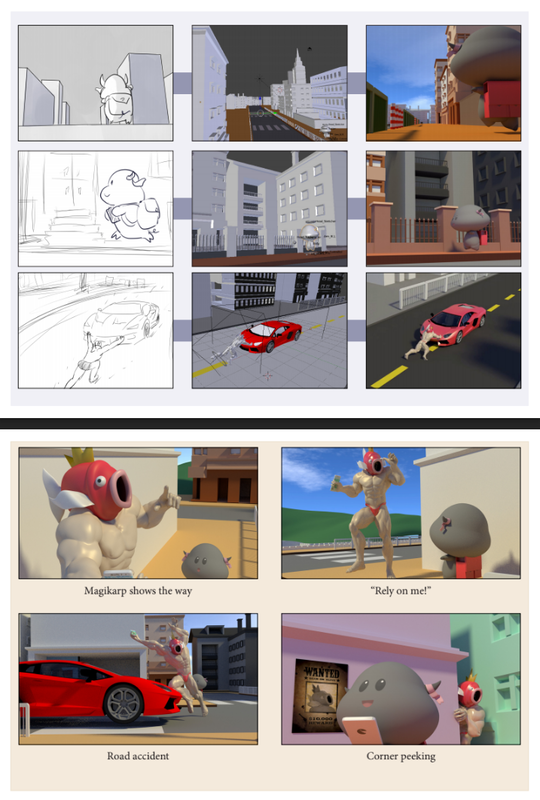 Terry’s portfolio showed a mix of realtime development in C++, Unity, OpenGL, as well as animation and storyboards. It was this variety of work that caught our eye. However during the interview Terry explicitly told us that he wanted to focus on animation and, knowing that, we were able to tailor the course to his needs. Now at the end of the course Terry has become one of the best animators on our team. Wen’s portfolio showed some websites he had built, a link to his github account and some supporting material displaying his 3D modelling and photography skills. This showed a range of interests as well as actual working code examples which were enough to convince us that he was worth interviewing. Within a few months of joining us Wen, Ben and our two coding staff had written the bulk of our Shotgun/USD pipeline which we won an award for at SIGGRAPH 2018. Alexis gave us a very impressive 2D art portfolio with some small amounts of 3D in Zbrush and Maya. During the year we noted that her eye was so strong that we were convinced that she could apply these skills in other areas. We offered her the chance to try lighting in Katana and Renderman and compositing in Nuke where she excelled. With this expanded experience and high quality work we feel she has a promising future! Samantha came to us with a showreel of her concept art, game animation and modelling work. This was enough to secure an interview during which Sam was able to share how eager she was to learn and gave a hint of her ability to pick up lots of software at speed that wasn’t really apparent in the showreel. Sam has gone on to be one of the most versatile members of the 2018 cohort. She animated hero characters, designed buildings, lit shots in Katana, comped in Nuke and in the last few months of the course learned and excelled at FX in Houdini and realtime FX in Unreal Engine 4. The advancements in her work over 1 year has been amazing to watch! 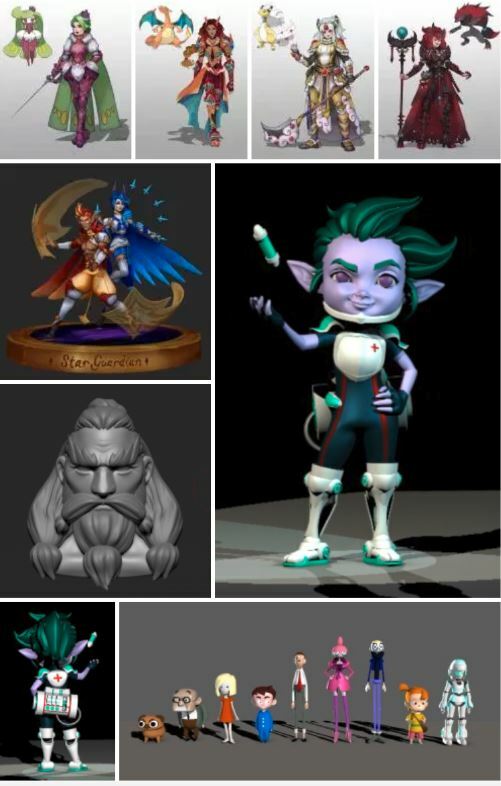 Jemima had a diverse portfolio that showcased 3D characters, rigging, environments, as well as 2D illustration work. This was enough to warrant an interview. During the course we quickly discovered Jemima’s incredible eye for light and colour, lighting seemed a natural fit. She delivered some beautiful shots for us using Katana, Renderman, Nuke, and has a very exciting future! Calum presented some of his modelling work and a surfacing test which was enough to arrange an interview. Calum started with us having predominantly used Maya for modelling however after being exposed to Houdini in the studio he quickly expressed an interest in upskilling in the program. Calum started using Houdini to augment his modelling work, building an entire city out of previously modelled buildings, and then expanded his knowledge of Houdini to include fire, smoke, rigid body simulation and particle FX. Jorge’s portfolio showed a variety of commercial and videogame work which showed a range of skills in vfx which was enough to interview. During the interview Jorge expressed an interest in rigging and so during the course we were able to plan his development to accommodate this. Jorge spent the majority of his year rigging with some time at the end of the year doing realtime FX in UE4. Ailisha’s showreel was incredibly strong so it was easy to see why we would arrange an interview. Unlike some of the other students for 2018, the main focus with Ailisha undertaking the Masters degree wasn’t to improve her skills (although of course she did), but instead to give her the chance to lead a team of surfacers. During the course Ailisha was given this opportunity and in her role as surfacing lead she was able to understand production at a big scale and to take her already very strong set of skills and match them with industry grade experience and mentorship.